We are proud to release the first preview of the new CL NUI Platform which consists of an SDK, API and a stable driver for Microsoft’s new Kinect Hardware (Xbox NUI Audio, NUI Camera, NUI Motor and Accelerometer) devices on Windows machines. 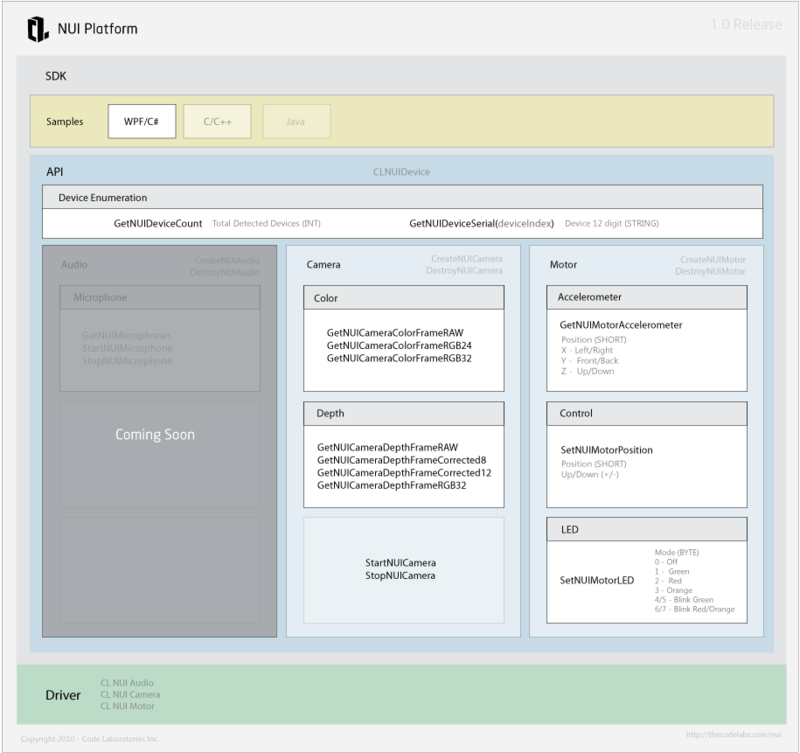 You can review the KB articles here to get started using the SDK Samples and more. To start we have a WPF/C# (.NET 3.5) Visual Studio 2010 Sample Application as well as C API (CLNUIDevice.h, DLL, LIB) and plan on extending the SDK similar to our CL Eye SDK which has Samples for C/C++/C#, Java and DirectShow. Thanks and please share any videos of it in use or feedback while getting started with the NUI Platform. Hi Alex, and thank you for your work, was waiting for something like that, I installed the sdk and demo. When starting the application I got a crash, if i do not stop the application i can see the GUI, control the motors&led and read accelerometer values, but i got black textures. @mitch A rather verbose error (thats a plus) have you tried restarting and or using other USB ports? Also what are your machine specs? It works perfectly and stable, I implemented sharedMemory to share disparity map with third parties ( just for fast prototyping). I took a look to c interface, how can be accessed the minimum/maximum disparity distance ? has to be done via software or it can be setted on hardware ? So to fixed your error mitch you just removed older drivers? About removing drivers, you have to un-install drivers for NUI devices, but you also need to check the “un-install driver software”, so windows will not reinstall the old drivers when kinect is connected, just love if i can avoid people loosing time wih that. The package really rocks, clean, working, stable and fast, nice work. About the disparity measures, once we have the depth frame, is easy to change minimum and maximum of disparity to “select” different Z - range, but if that values can be setted on kinect board (i dont wanna believe they are static values),so u can perform a different Z mapping, is a different result, and can be fine tuned depending on space light and so on. 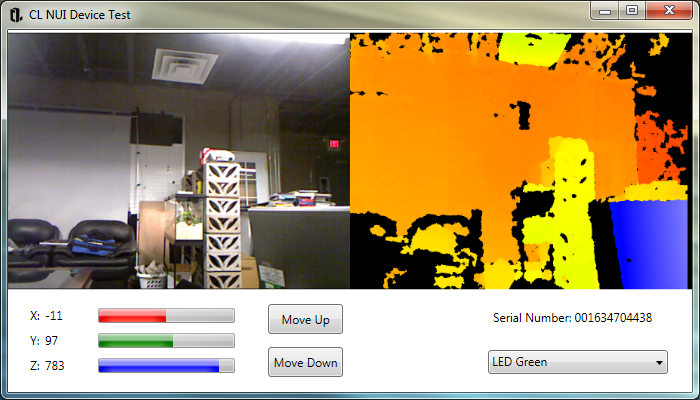 The depth map can be accessed directly in its raw form by using the GetNUICameraDepthFrameRAW API call. From the parameters you can see that you get 16bit unsigned value (depth) for every pixel. This is the raw data that we get from the Kinect Depth camera (after some processing done on-board by the PrimeSense’s SoC chip). Please note that even though we use 16bit data to store these values the actual usable data is only 11-bits (i.e. 0-2047). Anyone know of an online resource to get a Kinect from, that provides international shipping? Personally, I think it’s a mistake to simply port multitouch apps over to Kinect. Look how cumbersome it is to do simple stuff like dragging a picture or drawing on screen. It’s just for the cool factor, but not really useful. Kinect is great for very different kinds of apps, especially those that take advantage of the fact that the hardware can see your whole body. Dance Central is the perfect example. Anyway, great job as usual, Alex. Your work will surely spark awesome stuff. Thanks, man. It’s looks interesting, anyway it’s not clear to me if the SW is able to detect a specific part of the body, let me say the hand, and project it as a cursor on the screen. When the hand moves, you would see moving on the screen as it were a mouse pointer. This would be important for developing applications that get rid of traditional devices to perfom common tasks such as clicking and typing. I believe that without the exact pointer localization on the screen we would lose the full control of the application and thus we would limit the potentail of this interface. Another issue is related to the stress or fatigue that an interface like that may generate to the user when we perform common tasks for minutes. It’s not a matter if you’re playing videogame, because the fatigue is part of the game. however when we work with mouse and keyboard we limit movements mostly to fingers, while in these cases arms are more involved. Then, is the Sw able to detect people movements if they are seated? An interesting experiment that It’s worth trying is to place the controller on top of the room and pointing it to the desk where PC is placed. The camera should be able to detect hands moving on the desk. If we also added a projector we could create an interactive tangible surface without large setups used for bulding FTIR like tables. @frav: like I said, Kinect is not meant to replace current input devices. It requires a more open minded approach, and should be viewed as a radically new interface for radically new kinds of applications. Only that mindset would allow for truly cool stuff that actually takes advantage of the technology. Try to think outside the (x)box.